Valentine’s Day is only a few days away and whether you celebrate it or not, it’s always a good reminder to not only express love to your friends and family, but most importantly to love yourself. What better way to love yourself than to pamper the place where you rest your head every single night… your bedroom. We gathered a few simple ideas on how to turn your bedroom into a serene and romantic oasis. TEXTURE: Layering a variety of textures is visually stimulating and it’s warm and comforting! 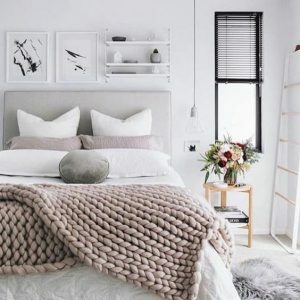 Try layering your bed with knit blankets, soft linen and velvet throw pillows. Waking up with your first step on a beautiful thick furry rug is also a pleasing thing to feel when climbing out of bed. 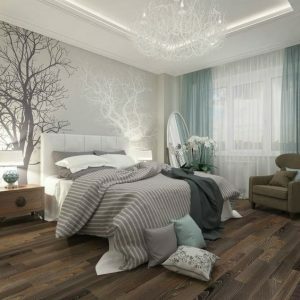 SOFT LIGHTING: Low lighting is homey and romantic all year round. You can install a dimmer or purchase a lamp shade that will cast a softer glow. 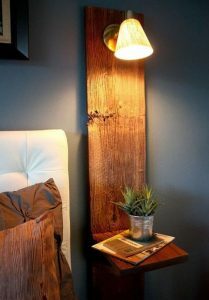 If you need a bright light for reading, try an overhead light that connects to your bed post or nightstand so the bright light is focused on your book and not the rest of your bedroom. WINDOW TREATMENT: Often windows in the bedroom get overlooked, especially when they already have blinds, but adding drapes really brings a room together. Do dark or light drapes, depending on how much light you want through once the sun rises. BOOKS, ART OR PLANTS OR ALL OF THE ABOVE: Some prefer to not display a bookshelf in their room because it either takes up too much space or they don’t want to be distracted while they sleep. But there’s nothing like a pile of books on the nightstand that cozies up a bedroom. 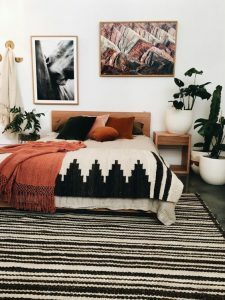 Add a piece of art that you love, whether it is a painting or a sculpture, incorporating art that makes you happy is always a beautiful thing to fall asleep to and wake up to. Bringing in a low maintenance plant or a vase of flowers into your bedroom adds life into your space. Certain houseplants also help clean the air, like the Spider Plant, Chlorophytum Comosum removes pollutants, formaldehyde and xylene. Looking for more design advice or custom furniture? Come visit our showroom and talk to one of our designers!